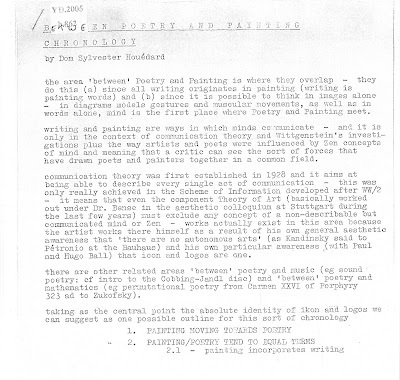 A curious item at the British library: "Between Poetry and Painting Chronology" by Dom Sylvester Houédard ("dsh"). 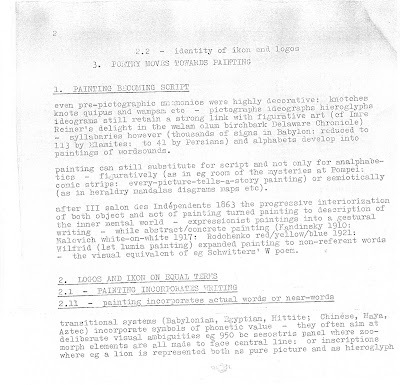 Searching for "Information Theory" and "Art" on the BL catalogue, I landed on this document. It was 14 pages of typescript on yellow/orange sheets of paper (roughly 2/3 A4 size - I don't know what that is called, if anything). I didn't realise it at the time, but further investigation seems to suggest it is associated with the exhibition catalogue for the Institution of Contempory Arts in London, 1965. As ever, making my own connections, serendipity makes this link between poetry and painting work for me. In the current London Review of Books there is an article about W. B. Yeats' Nineteen Hundred and Nineteen. I was struck by the way in which I needed the article to make the poem 'work' for me - it was entirely the same experience as I had with the painting of the Bellilli Family by Degas, that I discussed a while back. In both cases, though I needed the explanations, the explanations do not replace the poem/painting. The poem/painting retains a depth beyond the explanation.